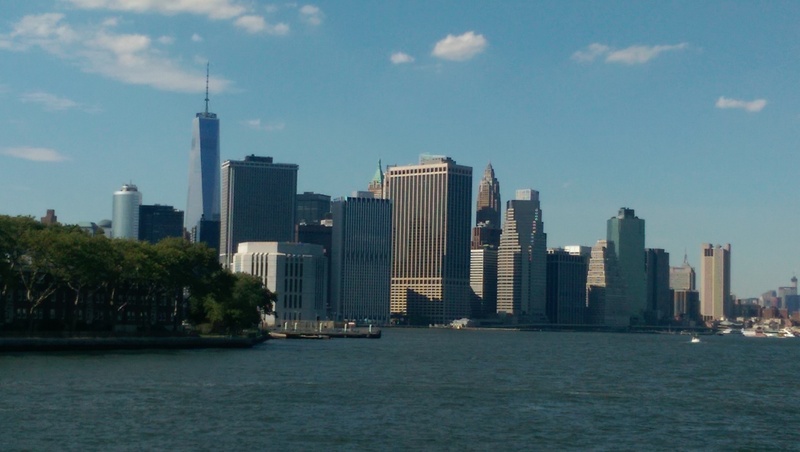 One of my NaNoWriMo writers critique group buddies invited people to meet up on Governor’s Island, which off the southern tip of NYC and to the west of Brooklyn. 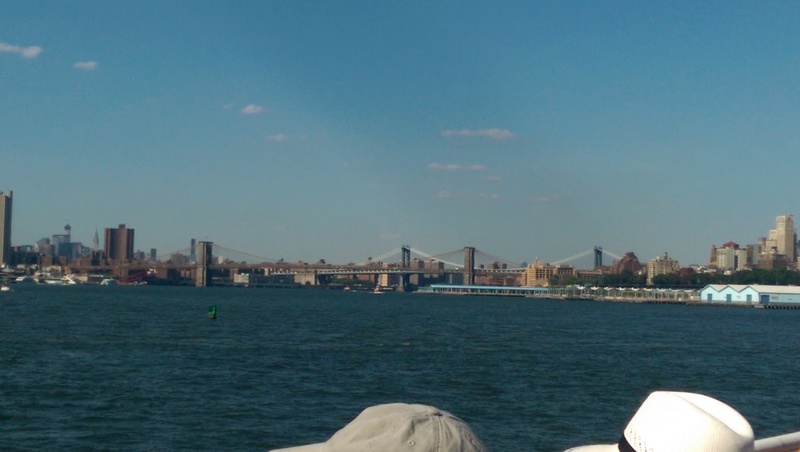 Since I had never taken the train to Brooklyn, or the bus in Brooklyn, or a ferry from Brooklyn, nor been to Governor’s Island, I decided to make the trip. The near-90 degree weather made it impossible to refuse! The LIRR from my town to Brooklyn was a decent ride. When I got to Atlantic Terminal, I wasn’t sure what to expect. Atlantic Terminal has a mere two tracks and is underneath a large mall. From the platform, you go up one story to street level. The terminal points to the intersection of 4th Ave., Atlantic Ave., and Flatbush Ave. The B63 bus stop was on 4th Ave. and Atlantic Ave. Nearby are two Islamic libraries and at least one halal market. As the bus rode up, I realized that I had lost my pre-loaded Metro Card and returned to the terminal to get another. I wrote it off as another person’s lucky day. After returning to the bus stop, I didn’t have to wait long until another bus arrived. The ride down Atlantic Ave. was lovely. Tree lined streets. People and families from all walks of life. People friendly and chatting. The bus rode the crest of Boerum Hill. The view of the harbor became visible as we came to the bottom of the hill. The bus left us about a block away from the ticket booth and the ferry. Boarding was relatively fast, but the trip was even faster. It could not have taken more than 5 minutes to pull into the dock on Governor’s Island. The views of the southern tip of NYC were fantastic. 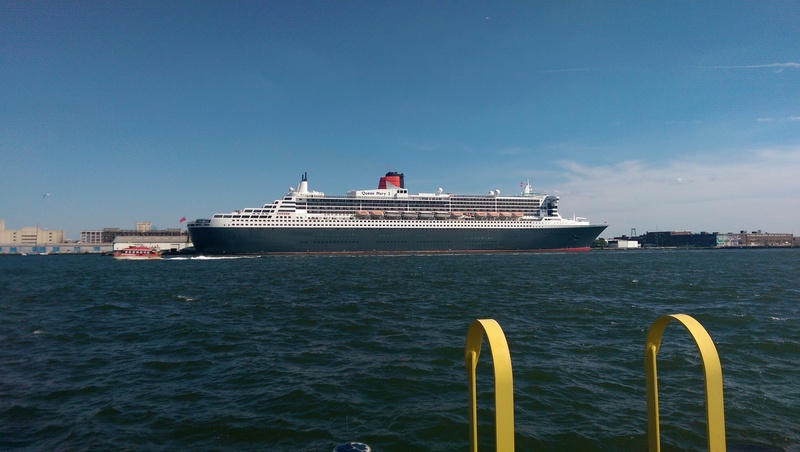 Shortly after we docked, the Queen Mary 2, which was anchored across from Yankee Pier on the island, tooted her exceptionally loud horn. I met up with my friend, and we spent the afternoon writing on picnic tables and dodging sunlight. You can either take your bike on the ferry or rent one from Blazing Saddles. Many Hasidic families came to the island, as well as families in general. I learned there were at least three food courts served by a number of food trucks. You can also rent multi-person pedaling carts with yellow canopies and child seats on the front. The gentle tinkling of bicycle bells and laughter joined us as we wrote the entire afternoon. The weather was amazing! Close to 90 degrees, low humidity, and a lovely breeze made for one of the best days of the summer. By the time 4:30pm rolled around, I was ready to head home. I got on the 5pm ferry and made it in plenty of time to take the 6pm train from Brooklyn back home. Taking a shower after a long, hot day and falling into bed were the last two things I did last night. I thought, “This is how it must feel after kids spend the whole day playing outside during the summer.” It can never be like it was back then, but yesterday came pretty close. My father used to say, “Don’t tell people to go to Hell. Tell them to go to Brooklyn.” He and my mother frequently told me how dangerous things were in New York. If you weren’t careful, people, places, and things all held the potential to rain terrible consequences on you. Any risk was too much. Avoidance and staying at home were preferable. As you might imagine, I was miserable. Any time I thought of doing something on my own, all I could think about was getting hurt. The world was big and scary. With my return to New York this past fall, I have begun to shake off the fears of exploring in and around New York City. Since I have been home, I have gone into Manhattan and taken the subway enough times to feel comfortable. With and without my husband, I have learned about areas and neighborhoods that I never explored in the past. My bus trip to the New York State World’s Fair Pavilion in April let me see new neighborhoods, meet new people, revisit a park that I had forgotten existed, learned geography in relationship to my home, and helped me start getting over my fear of New York City boroughs. Today I drove via the Cross Bronx Expressway (CBE) to meet friends at the Crosstown Diner on Bruckner Boulevard for a quick brunch (yum!). Then I drove up the CBE to the Sprain Brook Expressway (SBE) to a Citizens Bank in Yonkers to close out a security deposit account for a former tenant. As I drove on the CBE, I saw parks with children playing and signs for the Bronx Zoo, a place I have never gone. On my home way, I got on the SBE and saw two deer grazing by the onramp. The drive to the gym, which is generally in the direction of my home, was fast and easy. The best part of today’s drive was the bright, sunny weather, the warm winds, and the greenery. Driving through new locations, seeing new topography and wildlife, and expanding my territory all drive me to explore new places. I feel invigorated and satisfied, even though I spent a large part of my day driving. Generally, I feel more confident exploring new places in the daytime by car because it seems safer for me than going by myself or exploring at night. In the end, whether it’s by car or not, my exploring helps build my confidence to make decisions that involve an element of risk. Doing so on any day is a plus. Mark and I used to frequently go into area bookstores when we lived in Cambridge, MA. Our two favorites were the Harvard Book Store, also in Cambridge, and Trident Booksellers and Cafe across the river on Newbury Street in Boston, MA. To give you an idea, the cities of Cambridge and Boston combined comprises almost the same square mileage as the borough of Brooklyn. We could walk and/or easily take public transportation between these and other cities. Since we moved to my Long Island, NY hometown in September 2013, we have not been able to wander into any local bookstores to browse and buy books because there are none. Western Nassau County is only good for raising a family and sending them to school. Funk and art and cool are nowhere nearby. You have to travel by car, bus, or rail to find the cool spots. After my writing critique group yesterday, I met up with my husband Mark near Christopher Square on our way to find a place to eat. From Christopher Street, we walked along Waverly Place. We happened upon Three Lives & Co. Books on the intersecting corner with West 10th Street. The wide open doors beckoned, and so in we went. The ten light, French doors to the quaint bookstore cut across the corner at an angle. The red of the doors is a stark contrast to the matte black exterior and the gold lettering of the name across the top on both sides. In the display windows and the walls inside were floor to ceiling books. We wandered around separately, meeting up occasionally to share the excitement of books that we came across. Having made our purchase, we stepped outside and continued on our way. A joyful peace pervaded my spirit. Buying a book on Amazon will never be able to create this experience: the joy of touching and reading book covers, the excitement of exploring and of being exposed to new ideas, and the fervent looking forward of adding the next well-loved book to one’s collection. For my artist date this week, I went out on my own today, taking the bus to a place I have never been, to a place where I have never gone alone, and met new people. I am saving that post for tomorrow. Whenever I am stuck, it boils down to one obstacle: a deep-seated fear. My adult life has been devoted to uprooting my fears so that I can move on. Luckily for me, a 2+ year stint with a therapist trained in ACT therapy, IFS, and EMDR helped me thaw a number of fears so that my real feelings could find natural expression. In my family system, I was taught to fear a great many things: people, places, and experiences; things I could control and things I couldn’t; things inside myself and, especially, those from without. The message I heard over and over again were, in essence: Trust no one. Go nowhere. Do nothing. I have lived my life in a terrified state. How could I not? A lot of health issues and my birth order contributed even more reasons for my family to be afraid for me. But I have done a lot of fighting against it. The thing is, fear isn’t something you can fight against. Fighting feelings never works. Not for me, anyway. This morning, I avoided my morning plans (shower, eat, write, and go) by helping my mother. When that was done, I missed the first bus I could take. And then I did it: I took my first step towards getting me unstuck. Unstuck Step #1: I acknowledged that my plans scared me. I acknowledged that, by getting on the bus to start my adventure, I would be going outside my comfort zone and that it would be a bit scary for me. Unstuck Step #2: I took one small step to remove an obstacle that stood in my way – I made a phone call to find out when my mother’s car would be ready. I have to run some health-related errands for her. One of my excuses not to execute my plan was that her car might be ready soon. So I called the shop and found out they would do more testing in the afternoon. Hurdle eliminated! Unstuck Step #3: I got on the bus. Once my adventure started, I decided to read to pass the time. After a few pages, I put the book away and decided to watch the neighborhoods unwind by me. Trees were out in full bloom today – white and pink cherry blossoms, flowering pear blossoms, and green shoots opening up on the ends of tree branches. In a tree grove I passed full of these blossoms, five wedding parties were getting their pictures taken. The day was mostly cloudy, but with enough sun coming through that I got my first bad sunburn on a cloudy day. Ever. Unstuck Lesson #1: Acknowledge all your fears. Unstuck Lesson #2: Take a small step to move your plan forward. Try to learn about neighborhoods before you go so you can explore. Use a backpack, not a purse. Plan to stay the day. Bring snacks & a bit of water. Pack your go bag the night before. With enough experiences like I had today, I am hoping that my unstuck lessons will become as deeply learned as the way I learned to be afraid. If that happens, I will have to find other interesting writing topics. There is a lesson to be learned: Do not trust Google Maps on your Android Phone to know whether a business is functioning. Double-check with an Internet search to see if the place is still open. Better yet, pick up the phone and call to confirm they are still in business. A side jaunt to find the Funky Bead Bar in Port Washington, NY after food shopping at Whole Foods in Manhasset, NY, home to the strip mall for rich people (aka Americana Manhasset), turned out to be a dead end. Another bead store in Nassau County shuttered its doors, which leaves me with the only choice of having to go into Manhattan to bask in the glory of proper bead stores. I have a double-edged knife problem: I love to explore, but I get disappointed when my exploring repeatedly turns out to dead ends. What is the dead end? Nassau County on Long Island. Why? Because it has no bead stores. Oh, you can find beads in a store, such as Michaels or AC Moore. But that is not the same thing as a bead store who mainly has beads, beading supplies, and classes to teach you new techniques and designs. Working at Boston Bead Company in Cambridge, MA spoiled me. As an artist, I love to go into bead stores and see jewelry designs. I love to dig my hands into the bead bins and get a feel for the beads that will be laying against my skin. The small pleasure of touching beads is enough to have me smiling. When I spend time in bead stores or stores with local art, I became inspired to run home, dig out all my tools and supplies, and create something new. Since moving to NY in late September, I have barely worked on my jewelry projects. After reading Chapter 2 (Week 2) in The Artist’s Way by Julia Cameron today, I decided it was time to finish up last week’s project, Comet Tail Earrings using a variety of seed beads. 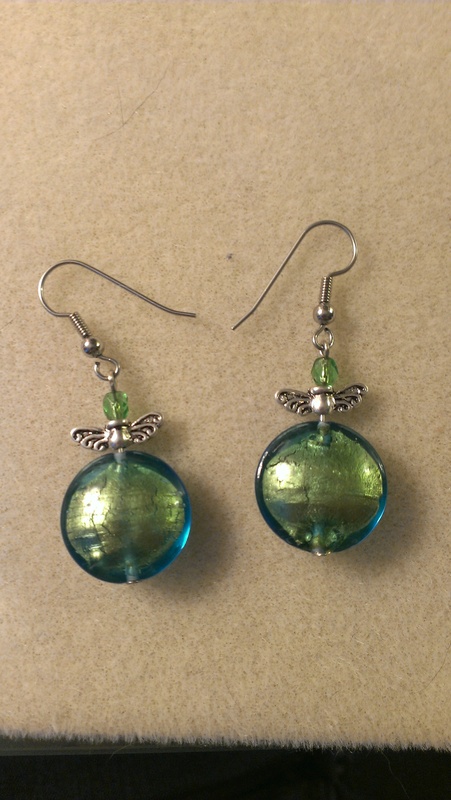 Then I decided to make another pair of earrings. I picked up the blue-green beads shown below in Flights of Fancy along with a Buddha bead that I intended to make as a set when I bought those beads. 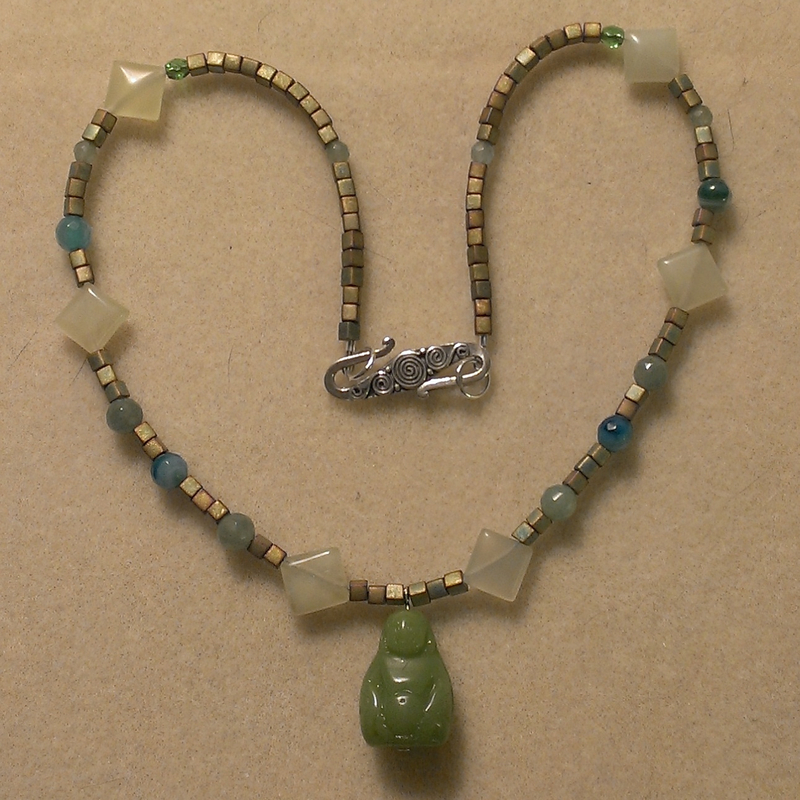 I started with the blue-green beads, added silver flying honeypots, and topped it with a faceted green bead. I slipped them onto the ear wire. Then I decided to make my Buddha pendant with flat-ended 20g ear wire pin. Once I had that, I pulled out my bead board, jade beads, my vial of square vintage tan-green-blue square beads, and blue and green spacer beads. I finished it with a silver S-clasp. I put the set on and modeled it for my husband, Mark. I was wearing a black shirt and went in the bedroom to see what the necklace looked like against my skin. I gasped at the image of Buddha floating above my blue lotus flower tattoo. I asked my husband to take a picture, and I decided to share it here with you. I hope you like the imagery, the tattoo, and the jewelry as much as I do.